We tend to imagine childhood as a time of carefree innocence—when youngsters play and go to school without the pressures and disappointments of adult life. Sadly, many children don’t enjoy this kind of idealized upbringing. For those in poverty, the harsh realities of the world become part of their day-to-day lives at an early age. Each year, more than a million American children are homeless at some point. A comparable number of children have at least one parent incarcerated in jail or prison. Many other families, while not homeless, are so poor that they struggle to provide food and other necessities to their children. Poverty is hard on anyone, but it is especially troubling when it affects children. Childhood builds the foundation for successful, healthy adult lives later on. If youngsters are deprived of an education or the basic resources other kids take for granted, they will sink deeper into a cycle of intergenerational poverty. That’s why Volunteers of America offers so many programs to help children thrive at a young age, no matter what their circumstances might be. We take a holistic approach to care, knowing that children can’t thrive unless their parents and other family members receive the support they need to overcome their own troubles and provide a stable home environment. As we head into back to school season, Volunteers of America offices in more than a dozen cities nationwide are embarking on their annual Operation Backpack programs. 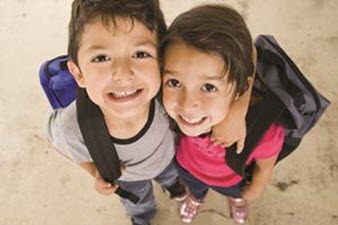 This initiative connects children in need – pre-k through high school – with a new backpack filled with grade-specific school supplies. But it’s not just about paper, pens, or binders – it’s about giving the gift of opportunity in school and life that many children will not receive otherwise. By helping those in need early in life, we can avoid a number of devastating social ills later on … and that ultimately helps improve society for all of us. Learn more about Volunteers of America’s Operation Backpack programs and the ways you can get involved on a local level.